What the heck is Ozone? A place to enjoy things beginning with the letter O? Ozone (O3) is an element in the atmosphere. It is an activated form of Oxygen which contains three atoms of oxygen rather than the two atoms that Oxygen (O2) contains. The additional atom of oxygen becomes a powerful, highly active element. You can feel ozone after a thunderstorm, near the ocean, or when you're in the mountains at high altitudes. The distinctive scents and feelings you experience in these places help you to recognize the potency of this element. Ozone is created when Oxygen combines with ultraviolet light and electrical discharges. It is present throughout the atmosphere, protecting the Earth by purifying the air and blocking harmful Ultra Violet Rays from the Sun. I. E. The Ozone Layer. Ozone has a wide variety of benefits in the proper forms and circumstances. It is not safe to breathe directly, but when infused into other elements, its power can be harnessed in a way that can be immensely beneficial. Ozone produces a multi-faceted and complex effect on the human body. Ozone is Nature’s most powerful anti-microbial, destroying all pathogens, like bacteria, viruses, and fungi, upon contact. When one uses ozone, only pure oxygen is left behind as the byproduct. Industrially, ozone is used to disinfect water, pools, and medical environments. Ozone is used throughout the world for the alternative medical treatment of serious infection, cancer, and immune disorders via intravenous therapy. It can also be injected into the body to regenerate and heal joints and areas of injury. Ozone is also a powerful detoxifier (think of the ozone layer purifying our air and making life on Earth safe). Ozone has the capacity to carry plentiful amounts of oxygen into the cells of the body, cleaning out toxic accumulations. I have personally used ozone extensively for my own medical treatment via major and minor autohaemotherapy (when ozone is combined with the patient’s own blood and then is returned to the body via IV or injection), as well as insufflation. I have found it to be incredibly helpful in many ways. Ozone is highly unstable on its own and when produced will only last for about 20 minutes in the air. But, when combined with blood for medical treatment or when infused over a long period of time into certain oils, it can be stabilized and utilized safely and beneficially. We can use certain types of oils to stabilize this highly unstable element in a safe and beneficial way. To create Elaa’s ozonated oils, cold pressed extra virgin organic olive oil goes through an extended process where ozone is bubbled through it. The process of fully infusing the oil with ozone takes many weeks. Once fully ozonated, the oil becomes a very thick and solid gel. Rare, special, and uniquely healing therapeutic essential oils are combined with the fully ozonated oil to dramatically enhance the healing properties of the ozonated oil. These essential oils also contribute additional healing and rejuvenating properties that make Elaa’s ozonated products for skin and oral care incredibly powerful and encouraging of overall optimum health. With its amazing ability to address pathogens and toxins, ozone is phenomenal for treating skin conditions. When applied to the skin, After the Rain – Activated Oxygen Miracle Balm carries ozone’s powerful properties through the cells. It heals damaged tissues, cleanses and disinfects, and stimulates rapid healing. After the Rain stimulates the growth of new healthy skin cells, and improves microcirculation. Dry skin will be moisturized, and swelling and inflammation will be calmed. After the Rain – Activated Oxygen Miracle Balm is superb for Acne, Rosacea, and Eczema. It also has a powerful affect for rejuvenating aging skin. After the Rain’s anti-aging benefits include: stimulation of cell growth and proliferation, free radical scavenging of harmful toxins, moisturizing facial conditioning. It repairs skin cells, boosts skin immunity, and improves skin structure. That's a lot of healing power! Let's knock out those critters and skin calamities! Ozone is also widely used by dentists to sanitize and clean the mouth and prevent infection before and after surgery or dental procedures. It also is restorative and healing for the teeth and gums, just as it is for skin. Fresh Breeze - Ozonated Oral Care Gel deeply stimulates every cell and gland in the mouth. It creates an accelerated process of cleansing and healing. It soothes pain, and inflammations are quickly soothed. Fresh Breeze - Ozonated Oral Care Gel also helps to clear toxins from the mouth and body, thus promoting systemic body health. The British Journal of Dermatology. 2005;153(6):1096-1100. Eczema is a frustrating and oftentimes painful skin condition. Its tricky to understand because, like many health conditions, the root cause is different for everyone. However, we can gain a deeper understanding of eczema and empower ourselves with life-transforming information that will assist in our healing. We can work through the eczema clearing process, and learn a lot along the way. Let's start by clearly defining eczema. . .
*the appearance of dry, red, flaking, blistering, and cracking rashes on the body. It also comes with a variety of different names, and it would seem that there are many different types of eczema, but these actually only refer to where on the body the rashes tend to occur. If only there was one simple answer to every eczema sufferer's greatest question! Eczema may take on many different forms and feels with even more root causes. You can look for clues or causes by asking questions like: When did this first appear for me (did it first come on in infancy, childhood, adolescence or adulthood)? Does my eczema come and go or is it consistently there? Do certain external conditions seem to trigger a flare (seasons, climates, living environments)? Do internal conditions seem to trigger a flare (menstrual cycle, stress response, identified or unidentified illness)? Highlighted below are four common contributors to eczema. These four things are oftentimes linked with one another. For example, toxin exposure and the body's inability to properly detoxify these toxins will lead to digestive issues, and ultimately low thyroid function. Infections as the root cause can also present a cascade of varying symptoms. 1) Toxin exposure. Excessive exposure to toxins will eventually overload the kidneys and liver, often causing the skin to take on the role of eliminating toxins since it has such a large surface area. This can lead to eczema and several other skin conditions. 2) Digestive issues. A low-quality diet can irritate or damage the lining of the intestine and reduce its ability to uptake nutrients and prevent toxins from crossing into the bloodstream. However, there are plenty of eczema sufferers who eat impeccably, but still experience digestive disturbances. In these cases, there is a strong likelihood that the troubles with digestion are secondary to a deeper root cause (such as chronic toxin exposure and/or infection). 3) Infection and Immune System Overload. Viral, bacterial and fungal infections, if unidentified and left untreated, result in immune system overload and over-reactivity. If the immune system is constantly fighting off infections, it can also be unusually reactive to what would otherwise be normal everyday stimuli. 4) Low thyroid function. This ultimately leads to reduced circulation. Since nutrients are delivered by the blood while waste and toxins are removed by it, this leads to waste buildup on nutrient-deficient skin, which causes the rashes that are so characteristic of eczema. Chances are, there is not one straightforward cause of your eczema condition. . . not the answer anyone experiencing eczema wants to hear, I know. If only there was one simple, easy to identify cause...and one simple, easy to identify solution! Instead, we're left with many possibilities. Fortunately, we're also left with an abundance of possible solutions! The first step is asking those questions and exploring the clues that we talked about earlier. Some people might feel like they have already asked all the questions, and just keep running into walls. Trust me, you are not alone! Its not always easy to figure out triggers and solutions. It's a very personal process that you must trust in. One thing is for certain. . . if you keep your spirit high and have faith in the total restoration of your health, miracles will happen in your life! You can do it! Benefits can only be seen by adopting a healthy whole-foods diet, tailored to your own constitution. If you are not doing so already, start here! If you suspect you might be reacting to certain foods, try eliminating them for several weeks, and then slowly reintroduce them (if you feel called to do so), one at a time. Look into food rotation diet ideas. Common food allergens that can contribute to eczema (particularly when they are non-organic/GMO) are pasteurized dairy (non-organic fed GMO feed), corn (most likely GMO if not certified organic), soy (most likely GMO if not certified organic), and gluten. You may also be interested in researching histamine-producing foods if you are currently in a state of hyper-reactivity. Turmeric - A strong anti-inflammatory with many benefits, especially for those with skin conditions. Burdock Root - A powerful anti-inflammatory that can help with many skin conditions, including eczema. Earth by Healthforce is my favorite source for Burdock and synergystic nutritionals. Chlorophyll - Fights bacteria, aids in wound healing. My absolute favorite source is Vitamineral Green. I don't know what I would do without my daily Vitamineral Green drink! Raw Fats and Cold Pressed Oils - Helps beautify the skin in many ways. Omega-3 Fatty Acids - Essential for body, brain, and skin health. The best vegan sources are E3Live, Golden Algae oil, Sprouted Flax, Chia Seed, and Marine Phytoplankton. Omega-6 Fatty Acids - Small amounts help acne, rosacea, psoriasis, and eczema. Evening Primrose Oil is my favorite source. Sulfur - Builds and repairs connective tissues for beautiful skin, hair, and nails. Helps detoxify the body and liver. Use plant-derived MSM. Horsetail - Helps the healing process and strengthens Skin - useful for rashes that crack. Nettle - Helps relieve many chronic skin conditions, including eczema. Coconut Oil - Increases blood flow to the skin, fights bacteria, and can be applied topically to moisturize and soften. Aloe Vera - fights inflammation and can also be applied topically. It is definitely worth exploring the possibility that your body may have some sort of underlying infection and/or toxicity that could be triggering the appearance of your eczema. There is a lot that could be written on this topic. If you suspect that this might be a contributing factor, getting a diagnosis from a qualified healthcare provider could help you move forward in clearing your skin (and feeling better all around). If you feel like you could use some guidance in pinpointing what may be going on and how to move forward, you may be interested in a HEALTH COACHING SESSION. The ultimate resolution of an eczema condition will come from within. There are also products that can be used to assist in the healing process, by calming inflammations from the outside-in. Be sure to choose an organic eczema treatment that will actually help heal and repair the skin without adding to its toxic load. Ozonated oils can be used to effectively treat inflammatory skin conditions. Ozonated olive oil is a powerful tool in the topical treatment of eczema. It works to deeply cleanse the skin, assisting in the resolution of commonly seen topical bacterial overgrowths in chronic eczema conditions. It will also work to remove a large number of harmful toxins from the skin, and will bring down swelling and inflammation. Ozonated olive oil encourages the growth of new skin cells, inviting healthy skin and a luminous glow. Experience the healing power of Elaa's After the Rain - Activated Oxygen Miracle Balm. Elaa's Living Organic Skincare starts with raw, cold pressed organic olive oil. The oil goes through an extended process of ozonating, where activated ozone is introduced and bubbled through it. Powerful, skin healing essential oils are then introduced, creating a powerful synergy of ingredients in this potent product. Learn more about the benefits of Ozone on the skin. You may also be interested in learning about elaa's Magic Healing Balm. This healing balm helps to seal in moisture to the skin, and is specifically targeted to treat eczema, as well as helping soothe skin conditions like herpes, cold sores, psoriasis, and contact dermatitis. It's antibacterial, ultra-hydrating, and helps promote skin cell regeneration. If your skin is extra dry with cracks, Magic Healing Balm can be applied after After the Rain - Activated Oxygen Miracle Balm to create a protective healing barrier. I love the Spring! The sun is shining more each day, the birds singing their sweet melodies, trees are budding and flowers blooming. It's truly a time to revel in the magic of life and beauty of new beginnings. Today we remind ourselves of harmonizing with the changing of the seasons. . . and radiating from the inside out! Pretty much everyone gets inspired to do a little extra dusting and polishing around the house when Spring arrives. It seems like the perfect time to clear out and clean out, and the same goes for our inner terrain. Spring is an excellent time to tune in to the body's natural rhythms, and assist and support our temple as it opens itself to its own new beginnings. You can approach cleansing from many perspectives: physical, emotional, spiritual. . . Wherever you start, your efforts and energy will carry over to all parts of life. Cleansing is a tremendous way to open yourself up to the life that you are here to live. Lifting burdens, in whatever form they may take, reminds you of your true nature. Its a great idea to pay attention to what's available locally when making your food choices. Spring is an exciting time to shop for produce, with all sorts of beautiful offerings becoming available. Look for spinach, dandelion greens, peas, parsley, fennel, watercress and asparagus. Simple raw salads and juices are a wonderful way to incorporate these fresh and flavorful foods into the diet. Warm brothy soups with plenty of tender veggies help hydrate and nourish your cells. Feeling inspired to take it a step further? How about a juice cleanse? There are all sorts of approaches here, but low-glycemic green juices are my go-to. A juice cleanse can mean different things to different people at different times and phases of life. It might mean making the commitment to drink a pint of juice every day, in addition to a healthy whole-foods diet. Or, you might decide to abstain from solid foods for a period of time and just nourish, cleanse and detoxify with juices. Both of these have their own distinct benefits, and your choice to juice cleanse is totally personal and relative to your body's present needs. Its important to be consciously gentle with ourselves during times of transition. With the changing of the seasons, we might notice that our bodies are feeling a little bit sensitive. Spending quiet time with ourselves, nurturing and relaxing, assists the process. Beautiful warm baths early in the morning or in the evening time are a perfect way to do this. There are plenty of options for healing additions that can be placed in the water. Epsom salts will give you a nice boost of magnesium, which will deepen your relaxation and also support pretty much every process in the body. You might also choose to use another favorite salt, such as mineral rich Celtic Sea salt, Himalayan salt, or Dead Sea salt. Also consider adding a few drops of your favorite therapeutic grade essential oils to heighten the experience. After a nice rejuvenative soak, its impossible not to think about adorning your body with skin-loving & health-affirming goodness! Spring is the perfect time to clear out your bathroom cabinets of items that may not be serving your highest expression of health and beauty (do this before your bath :). Invite into your life high quality and effective skincare products. I invite you to explore Elaa Living Organic Skincare's offerings for your sacred being. Here you will find a wealth of products and ingredient information to help you soar to your highest heights. If you are ready for a skincare re-boot, feel free to be in touch so that I may help guide you to the perfect products for your skin. Looking for more support? I offer health (and/or beauty) coaching backed by extensive knowledge and personal experience and guided by heartful care. After your are glowing and adorned, be sure to head outside for some deep breaths of fresh Spring air. Winter Solstice has come and passed in the northern hemisphere, and each day we are seeing a little more light. Yet, we still have more days of winter to come. There are some strategies that can be adopted to ensure that we cherish the experience of winter to the fullest! Today we will look at ways to keep ourselves feeling healthy, cozy, and beautiful through the winter season. Over the past 50 years, the availability and diversity of foods available to us at grocery stores have changed dramatically. With food now being imported from every possible corner of the globe, many have fallen out of touch with the fact that certain foods can only be grown in certain climates, are only available seasonally, etc. If grapes were to be purchased in California during the month of March, the informed shopper would be aware that they were not grown locally. This brings us to a key point: eating food in season, and grown as close to home as possible, will bring your body the greatest health benefits. Mother nature knows best, always! She offers us apples in the fall and dandelion greens in the spring with good reason. Nourishing roots grown deep in the ground provide us with tailored nutrients that our bodies crave and thrive on during the fall and winter, and as the weather warms up, we are attracted to the lighter side of things, flourishing on vividly colored foods with higher water contents. The method of your food preparation might also shift in the wintertime. Some find that they are more balanced by adding in more cooked foods, depending on their own body and geographic location. Soups made with lovingly prepared broths, plenty of veggies, and warming spices might be just what you need to warm up on a chilly day. Healthy fats will help keep you in balance, inside and out (assisting in keeping the skin soft and moisturized). Hot teas made with immune-supporting herbs are also an excellent ally to prepare and consume daily in the winter. Everyone has different supplemental needs, but there are a few common threads that we can all benefit from during this time of year. Be sure to get plenty of good fats in your diet, such as the super important omega oils (in their proper ratios). Also, with less sunlight, consider getting your vitamin D level checked. This is a common deficiency, even if you spend a lot of time in the sun. When supplementing, look for this vitamin in the form of D3 (as Cholecalciferol) for the greatest support. Include plenty of supportive herbs in the form of extracts and teas. Look into herbs such as medicinal mushrooms (including Reishi, Chaga, Cordyceps and Argaricus Blazei), Siberian Ginseng, Ashwaganda, and Astragalus to support and balance your body and spirit. Its easy to go into hibernation mode when its cold outside, but we can still find ways to move our bodies and break a sweat. Movement and sweating are really great for us, and most definitely support our body's immune system and natural cleansing processes. Find ways to get your body in motion...whatever feels good and works for you. This might include activities such as stretching, walking, jogging, dancing...or get bouncing on your rebounder if you've got one! Breaking a sweat is also a wonderful way to support your physical body. A vigorous run will do it, but there are also other options, like enjoying a sauna regularly. Check out Far Infrared (FIR) Saunas if you've never done so before...they are an amazing way to induce sweating and encourage deep cleansing. Following the sauna with a cold plunge or cold rinse in the shower (hot/cold therapy) provides incredible benefits to your entire being, with special emphasis on lymphatic drainage, circulation, detoxification, and immunity. This sort of circulation stimulation can also be achieved through a hydrotherapy shower. You simply rotate between hot and cold water while in the shower, making sure to reach every part of your body. If there is an area that is particularly sensitive or congested (such as swollen lymph nodes, stuffy sinuses, or sensitive kidneys, for example), be sure to pay special attention to that part of the body. Ideally you want to be in a hydrotherapy shower for about 15 minutes, so moving through seven rotations of hot/cold (keep the hot water on for 1 minute, then completely cold for 1 minute, repeat) works out perfectly. You will feel absolutely invigorated and refreshed once you have finished! Most everyone spends more time indoors during the winter. What a perfect opportunity to practice self-care and spend some quality time with oneself! How about turning the bathroom into your own spa, where you can encourage and inspire your spirit with an ever-evolving self-care ritual. . .
Baths are always my go-to number one choice if I'm in need of relaxation, nourishment, or detox. Before you get into the water, try a little dry skin brushing to stimulate the lymphatic flow in your body. Using a body scrub, like Elaa's Pumpkin Pie Body Scrub will also stimulate circulation, drainage, with the added benefit of exfoliating your skin and leaving it silky soft. You might also add some special essential oils to the tub, such as Elaa's WINTER REJUVENATION BLEND as a method to nourish your skin and calm your spirit. I also always include things like Epsom Salts, Mineral Salts, Clays, and Baking Soda for detoxification. Follow the bath with your choice of nourishing, Skin Restoring Body Oils or Body Butters. If you aren't in the mood to fully submerge, a foot bath is a brilliant option. This gives you the chance to direct some special attention to your precious feet. The feet are a major path of elimination for the body - toxins can be drawn out through the feet quite easily. Consider a moisturizing essential oil blend, clay for detoxification, or Epsom Salts (rich in magnesium) for relaxation and immune support. Follow your foot bath with a rich body butter to deeply restore and seal in extra moisture. Elaa's delectable Skin Restoring, Age Defying Body Butters are the perfect treatments for feet and hand beauty and softness. Loving Home Facials are something that I highly support and encourage! They are a great way to tune into your body's needs and create a luminous glow, while taking time to cherish yourself. For amazing customizable home facial options, check out Elaa's CLEANSERS, EXFOLIANTS, and MASKS. Finish these fun and gorgeous treatments with TONER, SERUM, TREATMENT, and MOISTURIZER of your choice. I also invite and encourage you to read over past blog articles, where common skin complaints are addressed, along with many tips for facials! Winter is the perfect time to really dial in your overall skin care routine, and discover what works best for you in terms of optimized choices. Make sure to use products created with integrity, and only those made with truly healthy, skin-loving ingredients. If you are interested in trying out some of Elaa's product offerings for the first time, a good way to go is the SAMPLE PACK, where you can select from a variety of different options suited to your own skin and desires. And as always, I welcome your questions and would love to assist you in finding the perfect skin care products for your needs! Just about everyone seems to struggle with skin challenges of one kind or another at some point in their life. It may come early, at an older age, or anywhere in between. It may last for just a short while or it may be a longer term challenge. One thing is for certain: no matter what you may have already been through, or whatever it is you are currently dealing with.....you are not alone! I myself struggling with acne, psoriasis, rashes, eczema, and other skin conditions most of my life and have studied very carefully how to heal this skin conditions. We all have these types of experiences, and there is plenty of support available as you navigate through figuring it all out. I'm here to be that support for you. For this post, I'd like to look at the most common of all skin conditions, acne. I'll discuss it's causes, and how to treat acne naturally. Skin problems are tricky in that they almost always signify an inner imbalance, and two people with identical looking skin troubles can have completely different causative factors. But once you are armed with the right information and action plan, there is no skin challenge that can't be conquered! It will require commitment and perseverance from you, but if you stick with it, your whole body will benefit from your hard work and dedication, and ultimately your health will increase in ways you may have not previously imagined possible! Acne, otherwise known as acne vulgaris, is a most common skin complaint. Sometimes it takes a pronounced cry for help from our bodies to alert us to an inner imbalance. Skin conditions are one of the most effective ways that our bodies can get our attention fast. After all, its hard to ignore an other-than-pretty pimple glaring back at us in the mirror. Acne is a trouble that most of us are familiar with, whether it has been experienced in mild or severe form. Acne has many potential causative factors, but there are a handful of really common ones that are most likely at play. Things to reflect upon in your own life in relation to your acne are diet and nutrition, digestion and assimilation, toxic load in the body and cleansing, hormonal balance, medications that you may be taking, and stress and stored emotions. The food that we choose to bring into our bodies is a very personal choice, and can have a huge impact on acne and the overall quality of our skin. If you have an interest in nutrition, you have probably encountered an overwhelming number of well-intentioned people claiming to have all the answers to your own body's needs. Most of the time, these people appear to be preaching their own gospel, that is, making recommendations based on what is currently working for them. The bottom line is, our bodies are all unique, and we all have varying requirements at different times in our lives. The key piece to take away here is this: listen to your body! Whether you have clear skin or are dealing with acne or any other skin condition, choose an organic whole foods diet tailored to your own needs. With an open mind, try out different approaches and see what feels best for you. Over time, you will discover how to tune in to your body and make the best choices. If you haven't done so already, eliminate any and all processed foods from your diet and replace with simple health-promoting real foods. Raw organic vegetable juices and fresh colorful veggies, consumed raw or cooked depending on personal constitution, digestion, and preference. Nutrient dense wild foods, such as seaweed, herbs, and berries. Warm healing broths. Bone broth is amazing for health and digestion. If you are vegan, try broths and soups with lots of veggies, roots, herbs, and medicinal mushrooms. Earth by HealthForce makes the perfect vegan, nutrient-dense broth. Health promoting algaes, such as E3Live, Marine Phytoplankton and Chlorella. Omega-3 fatty acids from foods and supplemental oils. Krill Oil is wonderful. The best vegan sources are E3Live, Golden Algae oil, Sprouted Flax, Chia Seed, and Marine Phytoplankton. Healthy fats such as cold-pressed unrefined oils, especially coconut oil, avocados, and sun dried olives. If you are in need of a deeper level of support in designing and implementing a personalized dietary approach, I offer private health consultations via phone or email. CONTACT ME to find out more about a personal consultation. Make no mistake about it: stress has a tremendous impact on our overall health. One of the fastest places it shows up is on the surface of our skin. Acne breakouts are a common experience for those experiencing high levels of stress. Discover and practice ways that you can relax and rejuvenate your being while, first addressing why you are stressed. Feeling all the feelings that arise when you dive into why you're stressed. Letting yourself express all of those feelings fully. And then, once fully felt, caring for yourself in nourishing ways. Hormone Imbalances can and will cause acne. There are many possible scenarios here, and it is important to know that any hormonal imbalance can trigger blemishes and breakouts. One example of this is seen when the body releases too many androgenic hormones (a common result of increased insulin production in the body). What follows is a cascade of excess sebum production, congested follicles, and in turn, acne formation. Another situation to be aware of is a sudden change in hormonal balance, such as that created by pregnancy or even certain illnesses. Also, an imbalanced estrogen to progesterone ratio in the body will often lead to breakouts before, during, or after menstruation. Talk to your naturopath or a practitioner you trust to help test your hormones and get them back into balance. There are certain medications that can actually trigger acne due to the imbalances that they create in the body. It is wise to hold an awareness of this possibility if you are taking any medications, and consider whether or not you may have other treatment options available that may be more beneficial to your long-term health. Contraceptive pills are a commonly used medication that creates body imbalances and can bring on breakouts. You will also want to steer clear of prescription acne medications for the same reason, and opt for a holistic acne treatment instead. While antibiotics are clearly a very useful tool in cases of serious medical need, it really makes no sense to use them as a long-term treatment for acne. We know that there is a clear link between acne and challenged digestive health. We are also aware of the fact that antibiotic usage further challenges digestive health, as it impacts healthy gastro-intestinal flora balance. By using antibiotics over extended periods of time in hopes of improving acne, you are actually setting up a cycle of increasing stress on one of acne's root causes, an imbalanced digestive system. This creates more harm than good for acne sufferers. We've talked about some of the causes of acne, and also the importance of diet in improving and preventing future outbreaks. Now we're going to go deeper into some of the other ways you can take a proactive acne healing path, and begin deeply healing your body and clearing your skin! When your internal body is overloaded with toxins that aren't being eliminated efficiently, the toxins begin eliminating through the skin....and this is when the skin issues arise! Look at it as a blessing: you are being alerted to the fact that your body is feeling overloaded with substances that are harmful to your health, and it is asking for your assistance in removing these accumulations. What an amazing opportunity for improving your overall level of health and vitality (and achieving clear skin in the process)! Detoxing is an important way to help clean out your system and help get rid of acne. Look into fasting and cleansing programs. Consider colon hydrotherapy to assist in the removal of accumulated toxins. Get out there and move your body with regular exercise, if you can. Rebounding (bouncing on a mini trampoline) is an excellent way to move the lymph through your body. Regularly working up a sweat is great for the body, be it through exercise or a sauna (check out far infrared saunas for their powerful detox abilities). The health of the skin is often a reflection of the liver's health status. Acne Vulgaris can be triggered by poor fat metabolism in the body (the process of digesting and assimilating dietary fats), of which the liver is largely responsible for. There are many approaches to cleansing the liver, some of which are more gentle than others. Start with your water intake: make sure you are drinking ample amounts of pure, properly structured water (preferably fresh spring water, but do the best you can). Eat a diet of clean whole foods, with plenty of fresh produce, personally tailored to your constitution and health status. Use liver supporting herbs regularly, such as Liver Rescue by Healthforce and elaa's Clear Skin Tea. Coffee enemas are a highly effective way to cleanse the liver/gallbladder as well. These can be done easily in the comfort of your own home. Please note that if you are highly sensitive to caffeine, this may not be the best option for you. I personally love the benefits of coffee enemas, but cannot tolerate them. Give them a try and see how you do! Castor Oil Packs over the liver are one of my favorite and are an easy treatment - I do them every night. Another powerful Liver detoxifer is Rectal Ozone Insufflation, or Enemas with Ozonated Water, if you have access to an Ozone Generator. There are some highly valuable supplements that you might consider incorporating into your routine as you heal your acne and your body. Think about enhancing your digestive system function, supporting your liver, assisting in the removal of stored and released toxins, and strengthening your nutritional intake with super foods. probiotics and digestive enzymes to support the digestive system. Friendly Force and Digestion Enhancement Enzymes. Adopting a healthy skin care routine will make a significant difference in your skin and overall health. Start by immediately eliminating all chemical acne treatments, like benzoyl peroxide, or any other “medicated” products from your life. These not only have a drying effect on the skin that is damaging, but the chemicals themselves are placing a heavier load of your body's ability to detoxify. Seek out natural products that are antibacterial, anti-inflammatory, antimicrobial, and antioxidant without the toxic load. There are many beneficial essential oils that can be added to carrier oils, skin care products, or applied neat (essential oils are highly concentrated: use caution before applying neat, or dilute first). Explore oils such as lavender, rosewood, eucalyptus, lemongrass, turmeric, geranium, grapefruit, sandalwood, vetiver, rosemary, niaouli, immortelle/helichrysum, thyme linalool, carrot seed, bergamot, chamomile, palmarosa, basil, and cedarwood. elaa's clarity - anti-acne skin rejuvenating elixir oil and clarity nectar - blemish spot treatment are specially formulated to tackle topical troubles in the form of acne! While skin challenges are never any fun to deal with, adopting a positive perspective and accepting the blessings of natural healing opportunities will take you beyond the bounds of what you have previously known to be possible. Natural acne home treatments will clear your skin and increase your health. Healing is a process and it takes patience, but as long as you stick with it and keep moving forward, your efforts will be rewarded with true and lasting health. Clarity Nectar is an organic natural acne spot treatment to create wonderfully balanced, crystal clear skin. This powerful detox mask will draw toxins and impurities from your pores, soothe, cleanse, and nutrify skin, creating a crystal clear complexion and the softest skin ever. This Organic Clear Skin Tea Blend helps to create clear skin by supporting and detoxifying the liver and cleansing the blood. Enjoy this warming and healing Skin Detox Tea. Keratosis Pilaris is a skin condition, also (unfortunately) known as "chicken skin," that is caused by a buildup of keratin. Keratin is the primary structural fibrous protein that makes up the outermost layer of skin. When excess keratin builds up it plugs the hair follicle and creates a bump. When multiple follicles become blocked, it creates rough skin that is covered in pink, brown, or white bumps. Keratosis Pilaris is most commonly found on the backs of the arms and legs, but can also be found on the face or back. Like all chronic skin conditions, the root cause of Keratosis Pilaris is the result of a internal imbalance. All chronic skin conditions indicate that the internal organs are not properly processing nutrients and/or toxins. Any toxins that build up in excess are pushed outward to the skin as a last resort for elimination, because the other elimination organs are not able to process the toxic load. Some skin conditions can also be caused by a lack of essential nutrients. To truly heal means to rectify the imbalance that is the root cause of the condition, which is internal - and to use topical treatments in conjunction with the internal treatments. Remove any foods from your diet that worsen your condition. Keratosis Pilaris is usually caused by food intolerances or food allergies. The number ONE cause of Keratosis Pilaris is the inability to process the Casein (dairy protein) found in all dairy products. Casein is a very common allergen and is particularly hard on people who have chronic illness. So, the first thing to do is to remove all dairy products from your diet right away. I do like Colostrum - which is low in Casein and very healing to the gut and immune system. Click here for my favorite: Surthrival Colostrum. It is now also possible to find Whey protein that is Casein-Free: Click here for Tera's Goat Whey, which is lower in allergens than Cow Whey and is Casein-Free. And one of my most favorite dairy-free, casein-free high protein healing foods is, Collagen. This is the Collagen I eat daily. I have seen first-hand Keratosis Pilaris go away completely when dairy was removed from the diet and come right back, as soon as it was added to the diet again. I, myself, was vegan for nearly a decade. Long term, I found that not eating animals foods or meat depleted my constitution too much, so I'm not recommended veganism here . . . but rather, detoxification and a healthy vegan diet when employed temporarily is detoxifying. Try reducing dairy and meat intake or trying a few weeks without out to see how you do. Just make sure you get enough plant protein during this time. All animal proteins, when eaten excessively, can potentially cause Keratosis Pilaris, so also remove eggs, or any other animal products if the condition doesn't disappear after about a month after removing dairy first and second meat. I have had reports that eggs was the cause of KP for several people. Each food should be singled out and removed for at least 6 weeks to see if the Keratosis Pilaris improves. If it does, try adding it back in, if you'd like, and see if it makes things worse. If so, consider removing it from your diet completely or reducing the amount. For treating Keratosis Pilaris (and for health in general) it is also important to eliminate: sugar, processed foods, fried foods, hydrogenated oils, and artificial ingredients. Allergy to gluten can also contribute to Keratosis Pilaris. In my opinion, gluten is not helpful for anyone, it is just hard for the body to process, even with no specific allergy present. As a final step, eat a low-glycemic diet - removing all sugars (even natural sugars like fruit or honey), starches, and carbohydrates (except for vegetables). Again, single out each individual food and remove it for at least 6 weeks to see if the Keratosis Pilaris improves. The best vegan sources are Golden Algae oil, Sprouted Flax, Chia Seed, and Marine Phytoplankton. Flush out the build-up toxins from foods or substances that are causing irritations in your system. The best way to remove congestion in the body is to cleanse with Colon Hydrotherapy. If you don't have a Colon Hydrotherapist near you, try enemas at home. Coffee Enemas are particularly powerful liver cleansers and are an ideal cleansing technique. I do coffee enemas at home four days per week. I consider them essential for anyone with skin conditions or chronic health issues. This is a great enema kit with everything you need. If you just can't fathom the idea of colonics or enemas, my favorite herbal formula is Intestinal Movement Formula by Healthforce. It is safe, gentle, and yet effective. While doing any detox, it is crucial to take a formula to absorb toxins that are being released so that they don't get reabsorbed in the colon. I suggest Intestinal Drawing Formula. I use this regularly and it's a great full spectrum formula. You can also make fermented foods at home for daily doses of Probiotics - make your own coconut water kefir, fully cultured kombucha, or sauerkraut and pickles. Do NOT eat fermented foods if you have Candida overgrowth. Get the Candida under control first. Lack of nutrient absorption can cause malnourished and dry skin and can contribute to Keratosis Pilaris. Digestive enzymes can help improve nutrient absorption and increase digestive fire. My favorite digestive enzymes are, Digestion Enhancement Enzymes. Vitamin C reduces inflammation and is required for collagen formation, so it helps to keep the skin healthy. The best sources of Vitamin C are Acerola Berry , Amla Berry, and Camu Camu Berry. I also use Liposomal Vitamin C daily, click here for my favorite. Vitamin C that is not inside liposomes is not well absorbed. There are a lot of claims from people who saw a reduction in their Keratosis Pilaris from applying coconut oil to it directly. Moisturizing is a huge help when it comes to Keratosis Pilaris, and coconut oil is wonderful for skin, but since Keratosis Pilaris is caused by internal issues, like all chronic skin conditions, try eating Extra Virgin Coconut oil instead to receive it's greatest benefits. Enjoy up to 3 tablespoons per day in meals. Tropical Traditions Gold Coconut Oil is the only Coconut Oil I use. Most Coconut Oil contains mycotoxins (mold), this one does not. The quality far surpasses any other coconut oil I've tried. 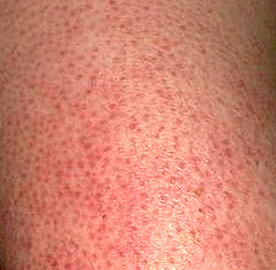 If used regularly, a dry skin brush can have a transformative affect on Keratosis Pilaris. Dry Skin Brushing can help prevent the hair follicles from becoming clogged. Dry skin brushing also has many other benefits such as increasing circulation, treating cellulite, stimulate lymphatic drainage, and improving skin health and appearance. Dry skin brush daily. Start at your feet and brush briskly in small, circular patterns toward your heart. Next, brush your hands, arms, torso, and neck. Natural Alpha Hydroxy Acids are the best topical treatment for Keratosis Pilaris. For Keratosis Pilaris, you'll want to exfoliate in two ways for best results, first by using Glow - Exfoliating Fruit AHA Dew, then by using a "mechanical" exfoliant - Cacao Goji Berry Antioxidant Scrub. The two types of exfoliants work together to most effectively renew skin and remove and prevent the hair follicles from getting clogged. Prime the skin with Glow - Exfoliating Fruit AHA Dew, a natural Alpha Hydroxy Acid fruit and flower treatment that helps the skin turn over properly and treats Keratosis Pilaris. Glow - Exfoliating Fruit AHA Dew also helps with acne, hyperpigmentation, age spots, wrinkles, and Milia. Next, use a scrub over the areas of Keratosis Pilaris. Cacao Goji Berry Antioxidant Scrub is a delicious chocolatey, fruity, nutty superfood scrub that polishes skin, is anti-inflammatory, and infuses it with powerful antioxidants. Cacao Goji Berry Antioxidant Scrub is formulated to be gentle enough for face, so it is perfect for using over Keratosis Pilaris, without irritating it and revealing smoother, healthier skin. Leave it on as a mask for as long as possible prior to scrubbing, for best results in dissolving Keratosis Pilaris. For more delicate areas and face, use Pineapple Illuminating Polisher instead in Cacao Goji Berry Scrub. Practice this exfoliation routine daily, or at least 4 days per week until you see and feel an improvement in your Keratosis Pilaris. Glow Exfoliating Fruit AHA Dew is a burst of fresh fruit acids for a radiant glow and a brighter, more youthful complexion. A fresh and juicy fruit and flower treatment for removing dead skin cells, treating acne, diminishing hyperpigmentation or age spots, reducing Milia or Keratosis Pilaris, improving wrinkles and fine lines, or simply creating a gorgeous, healthy glow. Reveal your radiant essence. This gentle, yet highly active microderm polisher leaves skin luminous. Pineapple enzymes renew the skin, while Velvet De Guérande tenderly buffs away dead skin cells and infuses it with rich minerals. Herbs and flowers calm, reduce inflammation, and cleanse the skin. Vitamins, bioflavonoids, and antioxidants revive dull and aging skin. You will glow with light shining from within. Refreshing, Reviving, utterly Illuminating! Dry Skin can worsen Keratosis Pilaris, so it's important to moisturize as much as you can. Apply a 100% natural, nourishing moisturizer directly after bathing. Massage a body oil over the areas of Keratosis Pilaris. Warming Oils stimulate circulation and help prevent or nourish dry skin, so they are beneficial for Keratosis Pilaris . For a warming body oil, try: Masala Chai Skin Restoring Body Oil - digestive support & skin circulation. For a calming, soothing, anti-inflammatory healing treatment for Keratosis Pilaris, try After the Rain - Activated Oxygen Miracle Balm. A super healing treatment for Keratosis Pilaris is Ozone! It's activated Oxygen, and yes the same element found in the atmosphere. It's miraculously healing. Keratosis Pilaris is not a permanent condition you have to live with. By removing allergenic foods, eating a healthy diet with plenty of nutrients, removing built up toxins, and using the proper skin care techniques and products, you can be free of Keratosis Pilaris for good. This past weekend was the Autumnal Equinox. As the seasons change, it is important to also make changes in our skin and health care routines. The air outdoors is cooler and drier, and the air indoors becomes drier as we turn on the heat. Our skin and hair has also just been exposed to a lot of elements all summer. Extra care and repair is now natural and important as we move into Autumn. For balance, harmony, and lovely skin, I recommend cleansing or fasting during the week of the autumnal equinox. If cleansing or fasting is not for you, eliminating all sugar, dairy, gluten, fried foods, and meat for several weeks is very helpful for decongesting your system and strengthening your immune system. You will definitely feel an increase in energy and clarity. If there are colds going around, or if I'm feeling run down, I like to juice plenty of fresh ginger and take shots of it or add it to full glasses of water. If you don't have a juicer, try adding a 2-inch piece of fresh organic ginger to your blender with a little water and a teaspoon of Ceylon Cinnamon, blend and strain and then add the "juice" to a full glass of water with a little stevia. This spicy treat will help fight off pathogens and leave you feeling "zesty." Supporting your Liver is also ideal during this cleansing time. This will also help promote clear skin. I like to drink plenty of healing herbal teas. Clear Skin Tea is a blend I created for supporting the liver, detoxifying the body, and treating various skin conditions. As always, stay well hydrated with plenty of spring water. I also like to keep my nasal passages clear and hydrated with use of a neti pot. Here are some other tips to implement during the autumnal equinox and into fall. Some skin issues that can come up as Summer turns to Fall include dull, dry skin with fine lines or irritation; sun spots and hyper-pigmentation, or flare-ups of some chronic conditions. Even though it's colder, it is still important to use sun protection in autumn on sunny days. For UV and Sun Damage Protection and Repair, try Sweet Light Before & After Sun Butter. Sun damage from a long summer in the sun can result in areas of hyperpigmentation on face, shoulders, arms, and hands especially. Moisturizing is more important than ever for every skin type. If you like to use a lighter moisturizer during the summer, using a richer moisturizer is now is a good idea. For body, applying a moisturizer directly after bathing is the best way to have conditioned, soft skin. Massage a body oil or body butter over the entire body while focusing on dry or rough areas. During cold and wet months, Warming Oils or Butters are of particular benefit. They stimulate circulation and help prevent or nourish dry skin. Or, contact me, if you'd like a custom creation. Some people may experience a flare-up of conditions such as psoriasis or eczema / atopic dermatitis in the fall. For some one that has suffered with Psoriasis most of my life, I am very sensitive to skin conditions and I have created several products that will help ease and soothe these conditions. A summer of bare feet and sandal-wearing can potentially cause dry, cracked heels. Dry, rough, or painful feet can be improved with a scrub and a rich, nourishing moisturizer. Try soaking feet in a warm bath with essential oils like, Lavender. Then scrub thoroughly with a nice scrub or pumice stone. Next apply and massage in a body butter. Finally, put on a pair of cotton socks to keep the moisture in. elaa Body Butters are great for feet. Dandruff can appear or flare-up during Autumn. I recommend treating hair and scalp with nourishing oils. Argan Oil is rich with Squalene, Vitamin E tocopherols, Fatty Acids, and potent Antioxidants. It is one of the most nourishing treatments for hair. Sacha Inchi Oil is also wonderful for repairing damaged hair. Coat hair and scalp in Argan Oil & Sacha Inchi Oil once weekly overnight or for several hours to restore hair luster and strength. Internal use of Omega 3 Fatty Acids is essential for supple, soft, clear skin. Deficiency in Omega 3 oils is often responsible for skin conditions. I particularly like Sacha Inchi Oil as a skin and food oil. The combination of Omega-3s, Vitamin E, Vitamin A, antioxidants, and amino acids makes Sacha Inchi Oil a wonderful skin treatment. Sacha Inchi Oil is also a valued nutritional supplement because it contains a high concentration of polyunsaturated fatty acids, making it an excellent source for Omega 3 (alpha linolenic acid) and Omega 6 (linoleic acid). It is high in protein, and rich in essential and non-essential amino acids. Add Sacha Inchi Oil to smoothies, salad dressings, any raw dishes that call for oil, or simply take a teaspoon. Many people suffer from Candida Infections or Candida Overgrowth (Candidasis). It is an extremely common infection that can cause a whole host of every day and more debilitating symptoms. There are very few people that actually don't have some candida overgrowth because of the rampant use of prescription medications that destroy the healthy balance inside the body and the Standard American Diet. Due to long-term childhood use of antibiotics, I had Systemic Candida Infection for most of my life. It was destructive to my health and deeply affected my life. Once one's immune's and digestive system has been compromised, It can take persistence to heal Candida Overgrowth completely. But, the good news is that once the Candida Overgrowth is cured, staying healthy only involves eating a healthy diet and maintaining a healthy balance of intestinal flora. What is Candida & Candidiasis? Candida Albicans is the scientific name for a whole family of yeasts that are naturally found in the intestines of healthy people. In small amounts, they're helpful for digestion and nutrient absorption. Candida becomes Candidiasis when it overgrows in the body and becomes out of balance. The causes of the overgrowth or infection include: antibiotic use, a processed and sugary diet (candida feeds on sugars), nutrient deficiencies, heightened toxic exposure, and any illnesses, drugs, or treatments that cause immune suppression. While sites of Candida Overgrowth infection can include the bloodstream and organs (a systemic candida infection), it is most common in the skin and mucous membranes. In the skin, this results in inflammation, redness, and itching. In the mucous membranes, this results in the typical symptoms associated with yeast infection or thrush. Candida Overgrowth is the cause of yeast infection and oral thrush. Some studies have shown that as many as 1 in 5 people test positive for candida overgrowth in their mucosal linings. While some people show no symptoms, most have several areas of compromised health. Any excessive bacteria or yeast that is growing where it shouldn't will lead to an overworked immune system, and can cause a huge host of symptoms that many people mistake for other causes or simply just think they have to live with. How do I know if I have Candida Overgrowth? In the morning, before eating or drinking anything, fill a glass with water and spit some of your saliva into it. Then, all you have to do is keep an eye on the glass of water every 10-15 minutes for the next hour. If your saliva does nothing but float on top of the water, you have nothing to worry about. If, however, tiny sprout-like strings have begun growing, or the water has turned dusty or cloudy, or your saliva soon sank to the bottom, you likely have a candida issue. 2) Second, to confirm the test, do this questionnaire. 1) If you want relief from the symptoms above, you must follow a strict anti-candida diet for at least 3 months. This involves absolutely zero sugars, fruits, grains, dairy, or sweet veggies. You can include superfoods, mostly green or non-sweet vegetables (no potatoes, beets, or carrots), green juices, occasional seeds (be sparing with nuts), seaweeds, and young wild coconuts (no sugary Thai coconuts). Also, raw coconut oil is composed of 48% lauric acid, which has anti-microbial, anti-bacterial, and anti-fungal properties that make it very helpful in combating candida overgrowth. 2) Take high doses of healthy intestinal probiotics (acidophilus, bifidus infantis, L. salivarius, L. plantarum, L. bulgaricus, etc.) that will colonize in the intestines. These are my favorites. Prebiotics are also valuable. These are foods that nourish probiotics (healthy bacterial flora). Prebiotics are indigestible foods that stimulate the growth and maintenance of beneficial gut microflora. The best ones to take to while on the anti-candida diet include chicory root, dandelion root, burdock root, and slippery elm bark. There are many herbal anti-candida formulas that I've tried too. There are several good one's available. CandiGone is a simple, more inexpensive one you can find at any health food store or here on Amazon. I've used this one several times. I also like to add a drop of Organic Therapeutic grade Oregano Essential Oil to a full glass of water - this pretty much knocks your socks off but is an effective, simple, natural treatment. Healing Candida Overgrowth is at least a 3 month process, for those with more severe cases, it can take up to a year or longer. Most importantly, strictly follow the diet for long enough (3 months - to a year) depending on the severity of your case. Second, take high dose probiotics. And finally, supplement with the above herbs/supplements or an anti-candida formula in high doses daily. It will not be effective if you take only the herbs and probiotics, but do not remove all sugars and carbohydrates from your diet. Fellowing the Anti-Candida Diet is essential. Some herbs used for anti-candida affects like oregano or neem are very potent, and should only be used in small doses for no more than a month or two at a time. Take a break from them and if you still have Candidiasis symptoms, start again. You may need to repeat herbal dosages, meaning if you are using an all-in-one formula, - you take all the pills / tinctures until you have finished all of it. Then, you take a break for about a week. After that, purchase a new one and start the formula again until you have used all it. If all of the symptoms go away and have been completely gone for weeks, then stop the herbs. Also, you can now move to Phase 1.5 of the anti-candida diet for 3 months. If any of the symptoms come back, go back to Phase 1 for 3 months and start with the herbs again. You'll want to always continue to take probiotics and prebiotics as a regular part of your diet, but you can eventually lower the dosage. It's also important to always be taking MSM, Vitamin C, and optionally Medicinal Mushrooms for good health. I take all of these everyday, candida overgrowth or not. If you are symptom-free long term, eat a healthy, whole-foods, unprocessed diet with zero refined sugars and starches. The only sweet things to eat are fruits and natural sugars, like honey or coconut sugar. Keep high and medium-glycemic fruits and natural sugars minimal. Fighting Candida Overgrowth can be challenging and being consistent with the diet and the herbs for as long as you need is completely essential. Over time, all of the symptoms should fade away for good, as long as you maintain a healthy diet free of sugars and refined and processed foods. . . and it will be more than worth it to have your health and your life back. How to Get Clear Skin. . . At Last! I personally struggled with Acne Vulgaris - or simply acne, pimples, blemishes, breakouts - for over 15 years. I have felt the pain and frustration associated with it. I often didn't want to see people or go out in public because of how I looked and felt. It was embarrassing and painful. I tried endless different products, pharmaceuticals, and skincare to try to find some relief. Everything I tried made my skin (and health) worse, rather than better. After many years of studying nutrition, health, and skincare, I finally learned how I could heal my skin. . . and miraculously, I did. I have had clear skin ever since. Acne (Acne Vulgaris) is an uncomfortable issue and a complex one. The reason it can be complex to treat and heal, is because there are many possible causes. • Hormonal Acne: Hormone Imbalances can cause acne - increased insulin production can signal the body to release extra male hormones, called androgens, which are involved in excess sebum production, congested follicles, and thus acne formation. Also, sudden changes in hormonal balance, such as those brought about by pregnancy can have a huge affect on skin and acne. An imbalanced estrogen to progesterone ratio in the body will often lead to breakouts before, during, or after menstruation. Any other hormonal abnormalities will also have an affect on acne creation. • Medications - including some contraceptive pills, anabolic steroids, lithium, iodine-containing medications, and some anti-epileptic medications, can cause acne do to the imbalances they create in the body. Forget about antibiotics for acne! I took these for years from the age of 12 and they completely destroyed my health and ultimately caused my skin to get worse. Because I decimated my healthy internal flora with antibiotics for acne, I struggled with Candida overgrowth for over 23 years, among other complications. Clear skin requires a healthy digestive system, which needs to be populated with a plentiful and balanced array of intestinal bacteria or Gastro-Intestinal flora. Antibiotics destroy all the healthy bacteria in your body - bacteria that is needed for overall health, including immune and digestive health. With all of these possible acne causes, what can I do? 1) A healthy diet and body free of toxins is essential. A healthy diet is more about what you exclude than what you include! A very acidic diet containing refined sugars and processed foods contributes to Acne Vulgaris. A diet that is too heavy with animal products, especially dairy, can also contribute to acne. Some people do just fine with some animal products, like meat and eggs, but usually people that have skin conditions are people that don't and should experiment with a plant-based diet, at least for a period of time. healthy fats like Coconut Oil, Avocados, and Sun dried Olives. MSM. Take with high quality, food-based, Truly Natural Vitamin C. They have a synergistic relationship - the Vitamin C helps the MSM work. A liver support supplement. I like Liver Rescue by Healthforce. Digestive Enzymes, my favorite are Digestion Enhancement Enzymes. Clays like Zeolite for absorbing toxins daily. I like to take these before bed. Drink Water, Water, Water - spring water or the most pure water available! 2) Detoxing is an absolutely essential way to get clear skin. Consider doing fasts and cleanses. These are one of the most important home remedies for pimples. Skin issues arise when your internal body is so overloaded with toxins that aren't being eliminated, so the toxins begin eliminating through the skin. A green juice fast for at least several days or weeks is intensely healing and alkalizing to the body and rejuvenating for skin. I highly recommend Colon Hydrotherapy in general and it should definitely be included as a part of any cleanse! Regular exercise is essential not only for overall health, but also for clearing toxins. Also saunas, skin brushing, and massage. Other things to consider in cleansing the body are possible Candida overgrowth. You can find questionnaires online to test yourself. 3) Acne Vulgaris can also be caused by poor fat metabolism. This means that the liver is not capable of fully digesting and assimilating all of the fat and oil entering the system. The health of the skin is often a reflection of the health of the liver. There are various ways to cleanse the liver. Drinking water with lemon every day helps. Eating Raw, Fresh, Organic Fruits and Vegetables is important. I like add large amounts of dandelion to my fresh juices for liver cleansing. Products like Liver Rescue and Clear Skin Tea are also simple daily ways to keep the liver healthy. Avoiding drugs, medications, and alcohol. Also look into doing liver flushes and cleanses, seasonally, or more frequently for a congested liver. For rapid and highly effective liver cleansing, coffee enemas are excellent. 4) Good skin care makes a significant difference! Immediately remove all chemical acne treatments, like benzoyl peroxide, or any other “medicated” products from your life! The chemicals and the drying effect are awful for skin health and overall body health. Look for products that are naturally antibacterial, anti-inflammatory, antimicrobial, and antioxidant. Beneficial Essential Oils to add to carrier oils, skin care products, or to apply neat (for certain essential oils take caution before applying neat, or dilute first) include: lavender, rosewood, eucalyptus, lemongrass, turmeric, geranium, grapefruit, sandalwood, vetiver, rosemary, niaouli, immortelle/helichrysum, thyme linalool, carrot seed, bergamot, chamomile, palmarosa, basil, cedarwood. Tree Tea Oil for Acne? What about Tea Tree Oil? While tea tree oil acne is a common treatment, it's not my favorite because it can be very drying and cause the skin to peel. 5) Hygiene is also important. Change your pillowcase regularly and avoid touching your face with your hands unless you have just washed them. There is no quick treatment or pill for skin health and healing. Pills and medications only cover over symptoms, create health problems, damage skin, and stop the possibility of healing. Healing is always a process. Natural Home Remedies for Acne are the only way to go - and it can take weeks or months to heal. Just take it step-by-step and take your time. Enjoy the loving process of coming into balance again. As I mentioned in the previous article about Rosacea, skin disorders are often the result of an internal imbalance. When the internal organs can no longer process the daily toxic load they're given, or when they're overwhelmed by unhealthy foods and chemicals, the skin acts as a conduit to release the toxins. Unfortunately, with what many consider a standard diet, overwhelm too often becomes normal, and we silence our internal cry for help by simply suppressing the symptoms of a chronic skin condition. While some natural topical remedies can help soothe and calm some skin conditions. Instead, often topical prescription medications that actually carry heavy risks are used to cover up the symptoms. But, the skin condition never goes away completely, or keeps coming back once the medication is stopped. This because the internal imbalance that is causing the skin condition in the first place needs to be addressed. I'm going to continue the Skin Condition Series by exploring how to heal another well-known chronic skin condition: Eczema. the appearance of dry, red, flaking, blistering, and cracking rashes on the body. There are four main causes of eczema. 1) Toxin exposure. As mentioned previously, excessive exposure to toxins will eventually overload the kidneys and liver, often causing the skin to take on the role of eliminating toxins since it has such a large surface area. This can lead to eczema or several other skin conditions. 2) Digestive issues. A low-quality diet can irritate or damage the lining of the intestine and reduce its ability to uptake nutrients and prevent toxins from crossing into the bloodstream. 3) Infection and Immune System Overload. An excess of bad bacteria, Candida, or parasites are common causes of Eczema. If the immune system is constantly fighting off one of these infections, it can also be unusually reactive to what would otherwise be every day stimuli. What can I do for my Eczema? Burdock Root - A powerful anti-inflammatory that can help with most skin conditions, including eczema. Chlorophyll - Fights bacteria, aids in wound healing. Omega-3 Fatty Acids - Essential for body, brain, and skin health. The best vegan sources are E3Live, Golden Algae oil, sprouted flax and chia seeds - like in Friendly Fats, fresh hemp oil/seeds, walnuts, and Marine Phytoplankton. Omega-6 Fatty Acids - Small amounts help acne, rosacea, psoriasis, and eczema. Silica - Strengthens connective tissue for strong skin, hair, and nails. Horsetail is an excellent source. 3) Abandon dairy and rancid (cooked at too high a heat) fats (except coconut oil and olive oil). These have been shown to exacerbate eczema. 4) Do a few colonics to help restore the body's ability to detoxify itself through the colon rather than through the skin. Alternatively, warm-water enemas during a juice fast or a herbal cleanse will also help. 5) Choose an organic eczema treatment that will actually help heal and repair the skin without adding to its toxic load. Activated oxygen and azulene... what? YES! Activated Oxygen or Ozone heals damaged tissues and hastens healing time. It kills bacteria, viruses, and fungi. Fully ozonated oil also activates the growth of new healthy skin cells and reduces inflammation. Azulene from Blue Cypress is also a potent anti-inflammatory. ﻿﻿It's my delight to introduce you to a revolutionary ozonated healing treatment balm for face and body that combines the power of ozone and potent essential oils. This pure and highly activated ozone balm was created for the most challenging skin conditions. After the Rain - Activated Oxygen Miracle Balm brings together the power of fully ozonated olive oil (ozonated for weeks) with the addition of anti-inflammatory, antibacterial, antiviral, antihistamine, and analgesic essential oils. A miracle treatment for eczema. If you follow these five steps, you should notice some relief of your symptoms right away, and, with time, it's possible that you will experience little or no eczema at all. As always, feel free to post your comments, questions, and personal experiences below! Especially, if you've tried any of the above methods and can offer what it was like for you. Our bodies give us so much information about what they need, but in our culture we are often not accustomed to looking or listening. Our eyes can’t see inside our bodies and look at our body systems and organs. And in many cases we actually don’t need complex machinery and medical techniques to have an idea of what’s going on inside. We have been given a permeable window to view our own health: our skin. It's time to look, listen, and honor how much our skin tells us about what we need, what we’re lacking, and how we can heal ourselves. In this spirit, I like to start sharing with you what you can learn from and do about skin conditions. I'll be sharing a series of articles about various skin conditions and how to make them a thing of the past. I've suffered with many skin conditions from the time of a few months old, so I know the pain, embarrassment, and frustration that is associated. I've healed my skin conditions and want to share with you how you can too. The first skin condition I’ll be talking about is Rosacea. There are also two subtypes of rosacea – rhinophyma, which causes the nose to become red and bulbous, and ocular rosacea, which is characterized by a burning or gritty sensation in the eyes. Why have topical treatments alone never healed my Rosacea completely? All chronic skin conditions indicate that the internal organs are not properly processing nutrients and toxins. Anything that builds up in excess is pushed outward to the skin as a last resort for elimination. This dampens the skin’s ability to maintain a healthy, natural state, and often results in disorder. In Rosacea, the cause tends to be excess heat and toxins in the blood. While Rosacea is almost always “treated” topically, it is not a just a skin something that is happening on the surface of the skin. It expresses through the skin and shows up there, but it is the expression of something that is going on inside the body. To truly heal means to rectify the imbalance that is the root cause of the condition, which is internal and use topical treatments in conjunction with the internal treatments. What can I do for my Rosacea? Eat liver and gallbladder supporting foods. Try starting each morning with a breakfast of light fruits, such as papaya, grapefruit, pears, apples, cherries, or similar. For later in the day, eat mostly vegetables, especially leafy greens, and raw nuts or raw seeds. Again, throughout the day, be sure to avoid alcohol, coffee, dairy products, and sugar. Drink huge amounts of water. The best herbs for blood cleansing are Burdock Root, Nettle Root, Dandelion Root, Yellow Dock Root, Red Clover, Nettle Leaf, Oregon Grape Root, Pau D’Arco, Chaparral. Take in tincture, capsule, or tea form. Dandelion leaf, Cilantro, Spinach, Parsley, Grasses (like Wheatgrass and Barley Grass), and any high chlorophyll foods are especially great foods to eat or make into juice for cleansing the blood. Herbs to add into your diet that support liver cleansing are milk thistle, dandelion root, and burdock root. Here's my proprietary Organic Herbal Tea Blend that will provide excellent liver support, detoxification, and helps to cleanse the blood. Cleansing the Colon is also essential. When you have a skin condition, you need more than just lots of fiber to help clear out the congestion and toxins that are causing your skin condition. The best way to do this is with Colon Hydrotherapy. If you have never had Colon Hydrotherapy before, you may need regular sessions for a while in order to really "clear out." There are also herbs that can be taken for colon cleansing. My favorite safe, gentle, yet effective blend is Intestinal Movement Formula by Healthforce. When you have skin conditions, one of the most important things you can do is to take plenty of probiotics daily for healthy intestinal flora. After cleansing or Colon Hydrotherapy, it’s also very important to repopulate your system with probiotics. The best sources are supplementation with multiple non-dairy strains of good bacteria, my personal favorite is Friendly Force. Also non-dairy Kefir - try Coconut Water Kefir, fully cultured Kombucha, or fermented sauerkraut and vegetables and great things to have as a regular part of your diet. Since skin disorders are usually caused by lack of nutrient absorption, digestive enzymes can help change this by increasing the amount of nutrients that are absorbed from food. I like Digestion Enhancement Enzymes, they are the most effective enzymes I've used. Many people with rosacea don’t produce enough stomach acid and should take hydrochloric acid supplements (betaine hydrochloride) before or after a meal (just be sure to keep the dosage low enough that you don’t experience any discomfort). Pancreatic enzymes are also important to supplement with, as many people with rosacea have been shown to have a deficiency in pancreatic lipase. If you are one of the ones who are deficient in this enzyme, and you also experience indigestion, both your symptoms and your indigestion will likely improve. A common problem among those with rosacea is deficiency of B vitamins. While a B-Vitamin complex can be helpful, the best ways to administer B-vitamins are either as patches or sublingually. Both methods have significantly higher Vitamin B absorption rates than through the digestive system. Apple cider vinegar is often prescribed as a natural treatment for rosacea. It’s best to take in liquid form with water. Aside from being good for you body in all sorts of ways, it specifically helps with rosacea by restoring the proper balances of acid in the stomach and intestinal bacteria. Other great things to include in your diet are: fresh Aloe Vera juice, Coconut Oil, Zinc and Selenium, and evening tea with soothing herbs like Chamomile and Rose Hips. If your case of rosacea is more severe and simply won’t respond to any of the above, then a full body detox may be necessary to help. The most simple way to do this is with a juice fast and a colon cleanse (regular colon hydrotherapy or an herbal colon cleansing formula and enemas), accompanied by clays like Bentonite and Zeolite to help absorb and carry the toxins out. This will eliminate toxins and remove any congestion in the liver. It will also allow more efficient functioning of the digestive system and other organs. The best topical ingredients to apply to skin that’s inflamed from rosacea are activated oxygen and azulene! Activated Oxygen or Ozone heals damaged tissues and speeds up healing time. It kills bacteria, viruses, and fungi. Fully ozonated oil stimulates the growth of new healthy skin cells and reduces inflammation. ﻿﻿I'm excited to introduce you to a revolutionary ozonated healing treatment balm for face and body that combines the power of ozone and potent essential oils. This pure and highly activated ozone balm was created with the most challenging skin conditions in mind. After the Rain - Activated Oxygen Miracle Balm brings together the power of fully ozonated olive oil (ozonated for weeks) with the addition of anti-inflammatory, antibacterial, antiviral, antihistamine, and analgesic essential oils. Azulene in Blue Cypress is a potent anti-inflammatory. An ideal treatment for Rosacea. If you follow all of these steps, you should be well on your way to healing your rosacea from the inside out, and may find yourself free of something you always thought you simply had to live with. I apply the same principals to skin care as I apply to food. Both are entering my body, whether through my skin or through my mouth. Therefore, because I care about myself, I choose beneficial and healthy substances to eat and use on my skin. Unlike the food industry, there are no legal standards for personal care products sold in the United States, meaning that we need to be savvy when shopping for healthy skin care, or organic face and body care. Read labels! If you can’t pronounce it, forget about it. And if it doesn’t sound natural, it probably isn’t. You might expect a product labeled “pure, natural and organic” to be, well … pure, natural and organic. But you might be in for a surprise. Because there are no legal standards for organic or natural personal care products sold in the United States, companies can, and often do, use these terms for marketing purposes. Just because a product is found in a natural foods store, for example, does not automatically mean it’s safe. Read and analyze the ingredient list carefully before buying. All of the elaa products are pure, organic or wildcrafted, and natural. Rejoice in safe, natural, luxurious, and powerfully effective skin care! 2. If you wouldn’t eat it, don’t put it on your skin! When you’re reading the contents of a bottle of shampoo, or any body care product, ask yourself “Would I eat this?” If I needed to, how would it feel inside my body? Even if you have no idea what an ingredient is, it’s very easy to get a gut-level instinctual reaction, especially when the ingredient you’re looking at is named Butoxyethanol, Nonoxynol-10, Propylene Glycol, and Sodium Lauryl Sulfate, Dioxane, or Ethanolamine. The skin is our body’s largest organ. It is also our body’s first line of defense against disease. Our skin is easily damaged by external factors (chemicals, synthetics, pollution) and internal factors (poor diet, drugs, etc.). Our skin is actually the primary means by which we absorb toxic substances. In fact, absorption by the skin is usually many times more efficient than ingestion. The skin absorbs chemicals into the bloodstream, which, in turn, are distributed throughout your body system. That is why there are medicinal patches for Hormone Replacement Therapy, or Nicotene patches. The chemicals are released slowly and absorbed quickly through the skin. Even though many of the skin care products we put on our skin promise to beautify the skin, the chemicals and synthetic ingredients actually take a terrible toll on the skin and on our general health. Compounds in synthetic cosmetics and perfumes stay trapped in the fatty tissues under the skin and remain there for years. These synthetic compounds require massive amounts of energy for assimilation, absorption, and detoxification – and that’s energy that is being taken away from your health, your beauty, and your life! I have a vast array of criteria when formulating, creating, or selecting skin and body care. Define what your personal criteria for selecting organic facial products, skin care, or body products is. Natural and plant-based - free of synthetics of any kind. Organic or Wildcrafted – free of chemicals and made from the most potent, living ingredients in nature. Raw – living natural ingredients that retain all their life energy, enzymes, antioxidants, minerals, vitamins and essential fatty acids. Hand-crafted in small batches - freshly made by an actual person, me, with great care and love. Any non-local ingredients are Fair Trade. Made with the highest integrity and ethics. Made with the highest quality ingredients possible. What about when you go someplace where you are subject to their products, such as a hair or nail salon? Find a hair salon in your area that uses safe, natural products, or do it yourself at home. I have been performing my own pedicures at home lately, and when I do go to a salon, I bring my own toxin-free nail polish (base coat, color, and top coat). Every salon I’ve chosen to has been more than happy to use my products. Also, make sure the salon is well-ventilated; if the smell bowls you over when you walk in, choose a different salon. Look for Nail Polish that is free of phthalates, formaldehdye, toluene, and acetate/acetone. Aquarella and Suncoat Water-based nail polish are safer brands. To check if your nail polish brand is safe visit the Skin Deep Database. Sign up for elaa's Newsletter HERE to stay up to date on healthy, effective skincare. Tell your friends and loved ones about those nasty, industrial skin care chemicals and share your healthy products with them. Choosing products that are natural, healthy, and close to nature is simple when you feel how beautiful, effective, and enjoyable they are! categories Detoxification, Toxins, Why Use Healthy Skincare?